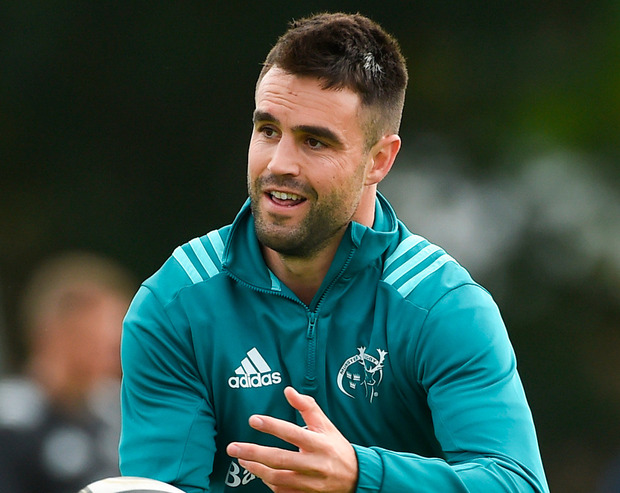 Steve Hansen hopped the ball and Joe Schmidt returned it by dint of a press release that brought the entertaining 'will he, won't he' debate about Conor Murray's availability for Saturday's crunch clash between Ireland and New Zealand to a close. The scrum-half is not in the squad for the remainder of the November Tests and, as such, will revert to his initial time-frame of an end-of-November return from his shoulder/neck problem. Ireland will also be without Robbie Henshaw for Saturday's game due to his hamstring injury, meaning Garry Ringrose should come into the team to partner Bundee Aki after Will Addison gamely stepped into the breach against Argentina. Kieran Marmion is the favourite to retain the No 9 jersey in Murray's absence, but he is under pressure from Leinster's Luke McGrath after his impressive outing against the Pumas off the bench. The decision may rest on the Connacht man's ability to train at Carton House this morning. He turned an ankle during the second half against Argentina and found it difficult to put weight on the joint before being replaced by McGrath. "He's a world-class player," Johnny Sexton said of Murray. "The three guys behind him are chasing him but they did well at the weekend, 'Marms' and Luke. "They'll be better for that experience as well. I think the more time you spend in the environment in here, the more comfortable you get and the better you get." Traditionally, Schmidt uses Tuesday training as a cut-off for involvement in the starting XV. Rob Kearney is expected to be involved and if he shows no ill effects of the shoulder issue that ruled him out last weekend, the Louth man should replace Jordan Larmour at full-back. Likewise, it is anticipated that Ringrose will train today after damaging his hip in the win over Italy in Chicago 10 days ago. The Leinster star's return should inject another layer of creativity into Ireland's attack. In the pack, Schmidt will be forced into one change when he names his team on Thursday with Dan Leavy almost certain to replace Seán O'Brien, who broke his arm against Argentina. The coach will also be tempted to bring Devin Toner back into the second-row for Iain Henderson to shore up the lineout. Hansen is expected to name Ryan Crotty as Sonny Bill Williams's replacement after the centre was ruled out with a shoulder issue, while he admitted he is toying with the idea of picking Scott Barrett in the back-row to counter Ireland's lineout having watched Argentina's success on Rory Best's throw with second-row Guido Petti playing in the back-row. Independent.ie Sportsdesk It was meant to be a confidence booster to conclude the November internationals but after the shock defeat to Fiji on Saturday, France now find themselves described by their coach as "a bit complicated". Rúaidhrí O'Connor In winning their 17th game in 18 and securing a 12-match unbeaten home run that extends back to November 2016, Ireland reinforced their position at the sharp end of the game.